Happy Halloween everybody! I hope that your day is filled with good fun, scares and laughter. 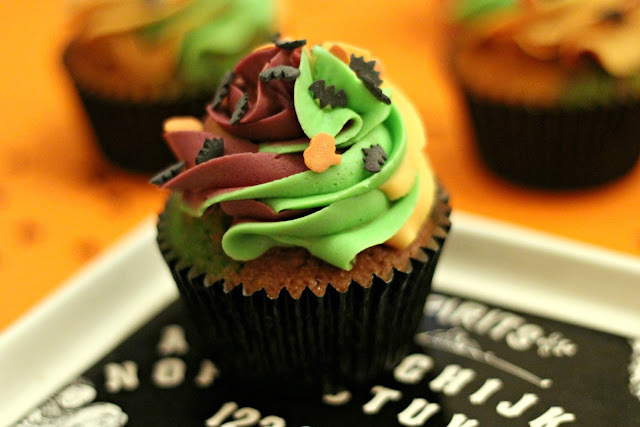 It's a little bit of a bittersweet day for me because although I absolutely love Halloween, it marks the end of the month and the end of my Halloween bakes. 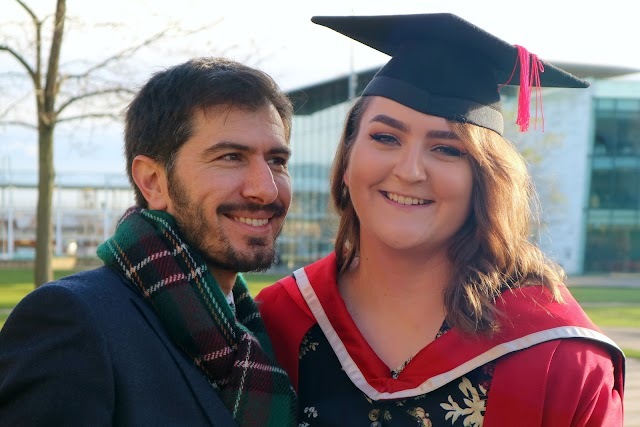 It feels so weird that a couple of months back, I'd planning all of the bakes you've seen on my blog over the last few weeks, and now I'm completely finished with making them all! 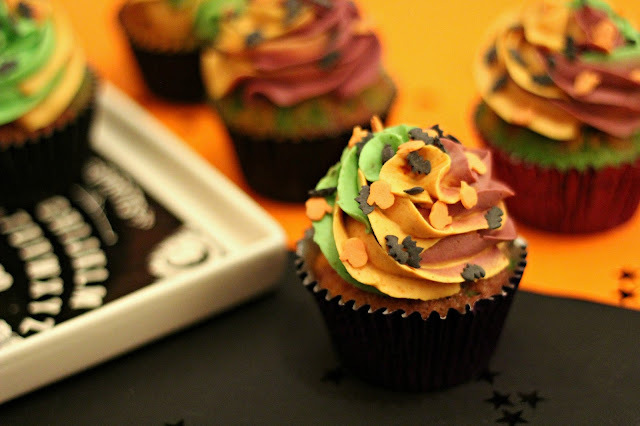 Of course, I had to save my most favourite idea until last, and that's my Trick or Treat cupcakes. I don't know if this is a thing in a lot of other countries, but in the UK, we have a tradition called trick or treating. Kids will go out into the streets, dressed up in their Halloween costumes, and knock on doors to collect as many sweets and goodies as they can. A lot of them will say 'trick or treat' as the door is opened, and some will sing that 'the sky is blue, the grass is green song'. I think way back when the tradition first started, people would also hand out tricks instead of delicious sweets, but nowadays, it's normally just treats that kids will find in their bags at the end of the night. But the idea of not knowing whether you're getting a trick or treat was my idea behind these cupcakes. So what exactly makes them a trick or a treat? Well, when I was planning this particular bake, I was obsessing over the Sugar and Crumbs flavoured icing sugar. I really wanted to try out a new flavour, seeing as though I'd only used the strawberry milkshake flavour, so I put out a poll on Twitter (who remembers that? It feels like so long ago now) to find out which flavour would be the most popular. There was lemon, bubblegum, raspberry ripple or salted caramel to choose from to pair up with a vanilla cupcake base, and it was the latter that came out on top, so that was the flavour that I went for when making the Treat cakes. In terms of the Trick cakes, I had a good long thought about how I could make them still taste good, but have an element that made them 'bad' in someway. I considered purchasing another icing sugar flavour that would be unexpected but still nice, but I figured that that wasn't 'trick' enough. So what did I do? I filled the buttercream with chilli powder. Yep, you read that right! Chilli powder. Now, I know what you're thinking, 'Olivia, you just said you wanted the cakes to taste good'. I know, but what I found was that the buttercream initially tasted just like regular vanilla icing, then after a few seconds, you get the heat. It's not unbearable, but it's definitely not salted caramel. When it came to decorating, I knew I wanted to go all out. I already knew that these cupcakes were going to be the final instalment of my 2017 Halloween bakes, so I didn't want to skip out. 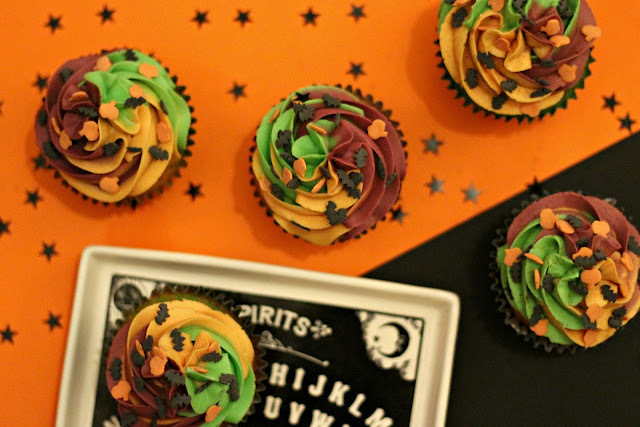 I wanted to incorporate Halloween colours, so I decided that I wanted to do buttercream swirls in purple, orange and green, topped off with black sprinkles. I didn't just stop there, though. 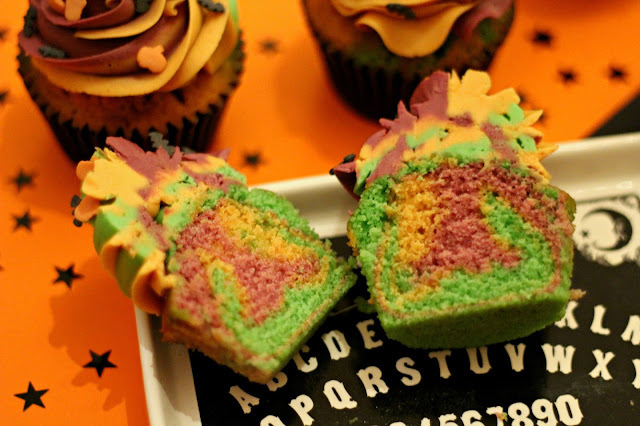 I also dyed the cake batter purple orange and green, and swirled them together in the cases to create a Halloween marble effect! I'd never done marble cake with colours before, only with vanilla and chocolate batter, but I'm so pleased with how they turned out. Preheat your oven to 180c/160c fan and line two cupcake tin with 20 cases. Separate your cake batter into three bowls and add food gel to each one until you reach your desired colours. Food colouring gel is a lot more vivid than liquid colouring, so go easy! Spoon different colours into the cases, alternating between colours and filling them until they're just over half full, then bake for around 18-20 minutes. Remove them from the oven and allow the cakes to cool for 10 minutes in the tin before transferring to a wire rack to cool completely. To make the salted caramel icing, beat 250g of unsalted butter in a large bowl to soften it. Add in the salted caramel icing sugar and beat until you have reached your desired consistency. If you can't get the flavoured icing sugar, use normal icing sugar, then add in caramel flavouring. Separate your icing into three bowls and colour to your liking with the gels. Roll out a piece of cling film/saran wrap on your countertop, then pipe each of your colours on to it in straight lines. Make sure that you pipe them directly next to each other, so you get nice, clean lines. Fold your cling film over to form a Halloween icing sausage (I find a folding action works better than rolling the icing), then seal the horizontal edges together and twist the edges to trap the icing inside. Using a pair of scissors, cut one end of the cling film, close to the icing, then slot the icing sausage inside a piping bag with your favourite nozzle in. 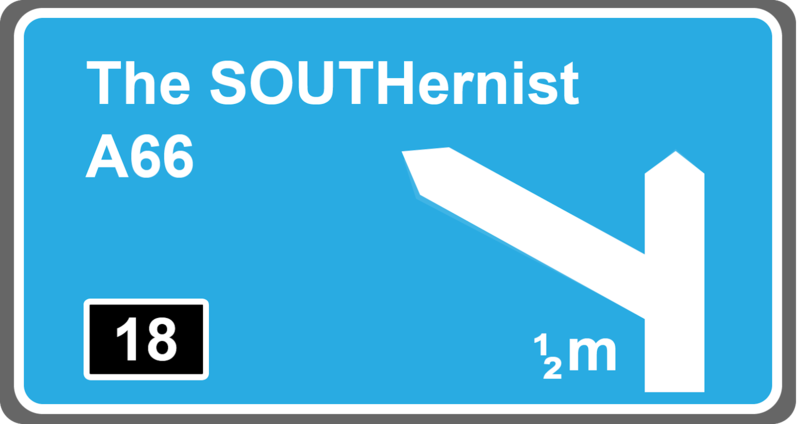 If you can't visualise what I mean, take a look at this video. Pipe the icing on to 10 of the cupcakes and set them to one side. To make the chilli icing, beat 250g of unsalted butter in a large bowl to soften it. Add in the icing sugar and beat until you have reached your desired consistency, then add chilli powder, tasting as you go. If you want a more subtle chilli flavour, you can add a small amount, but if you want something a bit more fiery, add in as much as you like! Follow step 8 and pipe the icing on to your remaining cakes. Decorate however you like! I want for bat sprinkles with a few pumpkins thrown in. 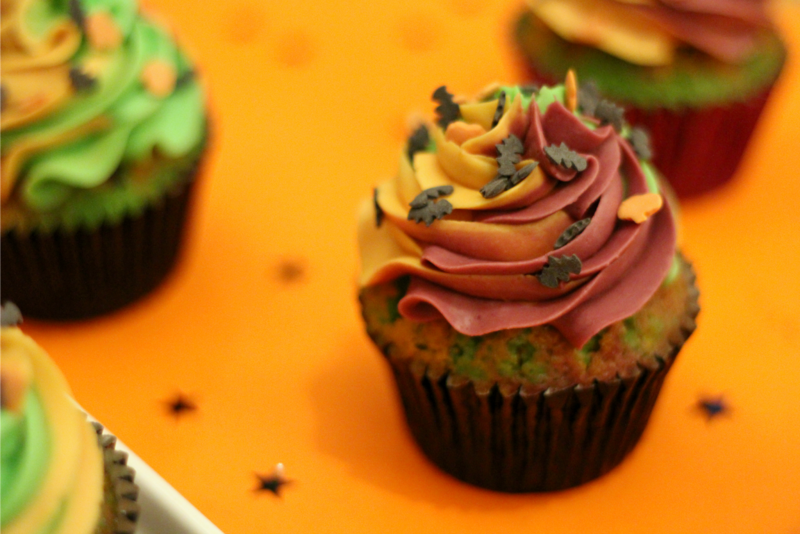 Make sure you use the same decorations on each cake so that no one knows which is the trick and which is the treat. There is a fair amount of work that goes into making these guys, but the effect is just downright fabulous. I did wonder a little bit about how I would be able to tell the two flavours apart, so what I did was use two different cases, purple for trick and black for treat, but if you're daring enough to make them all exactly the same, then go for it! There's still plenty of time today to make these for anything that you may have planned tonight. They'd be fab for a party, especially as a bit of a Russian Roulette type of game, or as a trick or treat goodie for any grown-ups that may be taking their children to the doors. Again, I hope you all have a great day and I already can't wait for next year to come around so I can start to plan Halloween all over again! The cupcakes look amazing! I'm practically clawing at my screen trying to get my hands on one. I'm loving the fact you put chilli power in the buttercream for the trick cupcakes, I would totally freak out if I bit into a cupcake and it started to get hot so anyone who does this will get a good laugh at my utter confusion. 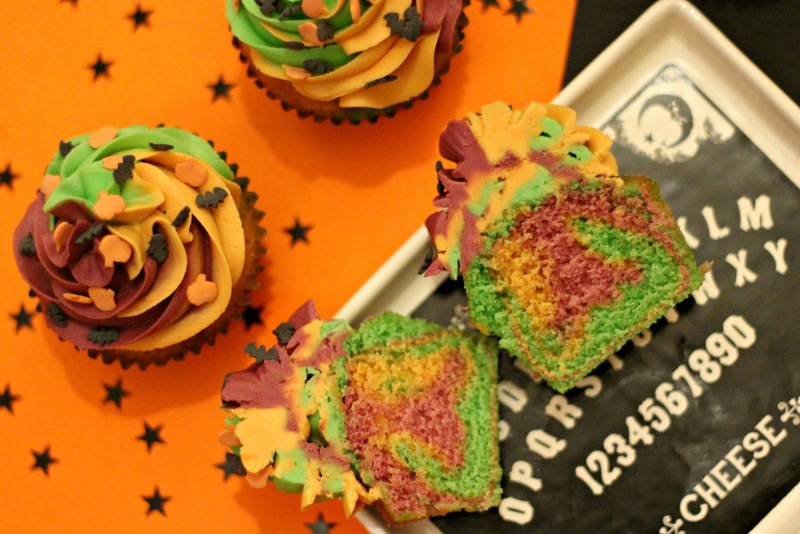 I'm going to miss your Halloween bakes but there's always next year! What a marvellous idea! I would never have guessed they had chilli powder in them, they look delish!